This punch was served at the baby shower, and it was a smashing success. Light, refreshing, not too sweet, and sooooo pretty! Puree the frozen raspberries in a food processor until smooth. In a punch bowl, combine pureed raspberries, pink lemonade and ginger ale. Stir to combine. Slice lemon into thin rounds. 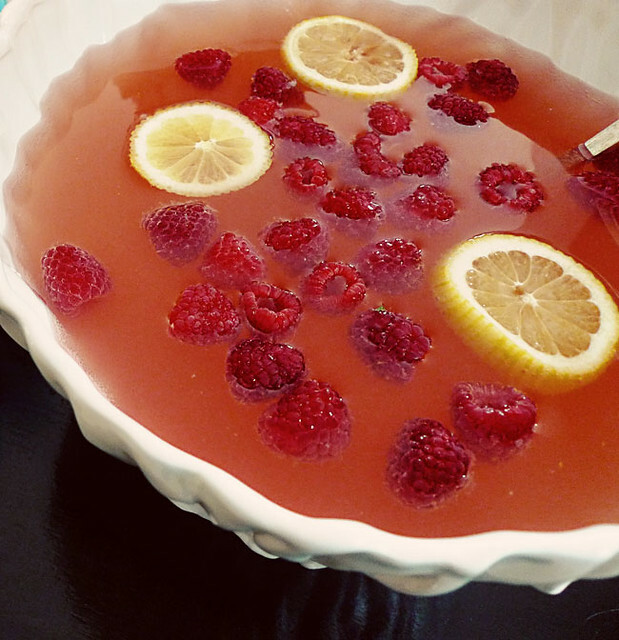 Float lemon rounds and fresh raspberries in the punch. Serve and enjoy! The photo was taken before pureed raspberries were added (sorry! we were waiting for the food processor to arrive.) They did add a delicious real fruit flavor, but you can leave them out if you desire. Don't forget to refrigerate your ingredients beforehand, that way you won't have to dilute the punch with ice. I prefer punch without ice cream. So foamy! So Sweet! So messy! So impossible to eat the ice cream out of the bottom of a cup! But, if that sort of thing makes you happy, feel free to add a pint of vanilla ice cream or raspberry sherbet. The recipe multiplies very easily. This amount serves 12-16 people. I just kind of threw this recipe together, obviously it would be simple to switch ingredients out and change up the flavor... Sparkling Strawberry Lemonade...Sparkling Limeade...Sparkling Lemonade... etc.